I have been a big chocolate lover my whole life. If you ask my siblings, they will tell you I can be a generous person sometimes, but never when it comes to chocolate: every year, the bars that I would get as birthday presents went directly to a secret drawer in my room—to later be slowly enjoyed while reading a good mystery book (I would argue, however, that age has made me more generous, or maybe just more able to buy myself some chocolate when I want, and hence less of a Scrooge). Given this love for chocolate, it is quite interesting that only this summer I came in first contact with the fruit from which it derives. 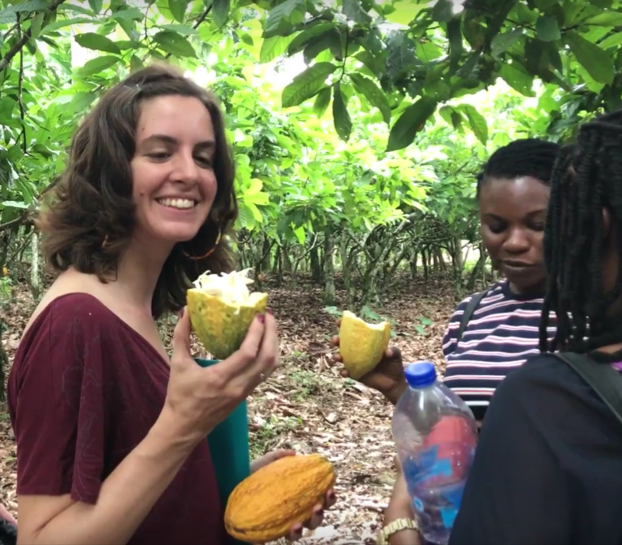 Last week, in a farm in the Suhum district of Ghana, a kind farmer opened a fresh cocoa pod for me, and I finally discovered the taste of raw cocoa. It was very different from what I expected: sweet and slightly citrusy, closer to lemon cream than to chocolate as we know it. Here I am, just seconds away from tasting fresh cocoa for the first time. Unless you live near the equator, it is very likely that your experience is similar to mine, in that the closest you have come to actual cocoa is through cocoa powder or cocoa butter, intermediate products that later become chocolate. This disconnection is no coincidence, but a structural characteristic of the cocoa supply chain: around 60% of the global cocoa production happens in two West African countries, Cote d’Ivoire and Ghana. Yet, the whole African continent consumes only about 3% of the chocolate produced globally, while Europe and the U.S. together account for more than 70% of this consumption. Several of these cocoa farmers with whom I talked this week have never tasted chocolate in their lives! 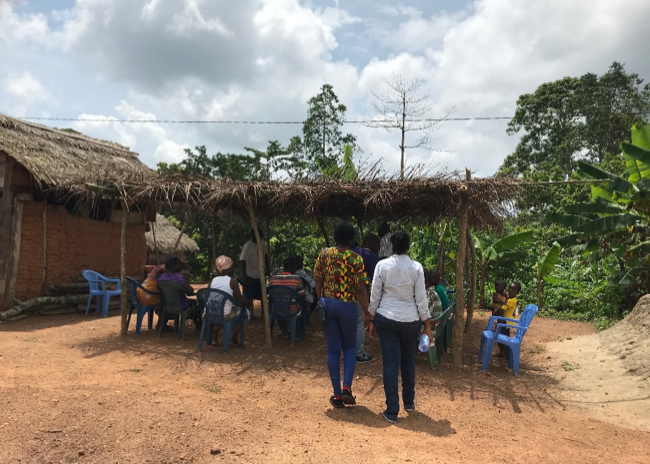 Group interview with cocoa farmers in the Central Region of Ghana. Cocoa is the main agriculture export in Ghana, accounting for 7% of its GDP and a quarter of their exports; yet it is produced almost exclusively by small-scale farmers that grow cocoa trees in few acres of land and take care of them with the help of their families. This makes cocoa a highly informal sector with an important portion of unrecognized labor. In many cases the farmers’ wives and children perform key tasks in cocoa production without being acknowledged as cocoa farmers or receiving any of the income. Issues like this one are not exclusive to the cocoa sector. Our food system has become highly complex and globalized, and a great proportion of the products we consume can be traced to a few transnational companies on one side, and millions of small producers on the other one. These global supply chains have severe social and environmental impacts that affect disproportionally those who produce the raw materials. Launched in 2013, Oxfam’s Behind the Brands campaign (BtB) is a global effort to hold the top 10 food and beverage companies responsible for their supply chains. The campaign led these companies to commit to improving their policies regarding land, water and workers’ rights, gender equality and climate change, among other issues. The next stage of the Oxfam campaign monitors implementation of such commitments. For our Keough School i-Lab project, my Master of Global Affairs colleagues Moaz Uddin, Caroline Andridge and I have been supporting the work of Oxfam’s country teams in Malawi, India and Ghana on the implementation of this project at the national level. For the case of Ghana, the focus is, as you may already imagine, cocoa. The task sounds more straightforward than it really is: I imagined we could take the main chocolate companies, review their policies, trace the communities where they are sourcing their cocoa, and see if such commitments and policies are being implemented there and how. Sounds easy, right? Reality is, as we keep discussing at the Keough School, more complex; linking companies with cocoa producers is a harder task than I imagined: each level of the supply chain ─ companies, traders, government agencies, middle-men, cooperatives, farmers ─ is a puzzle in itself. 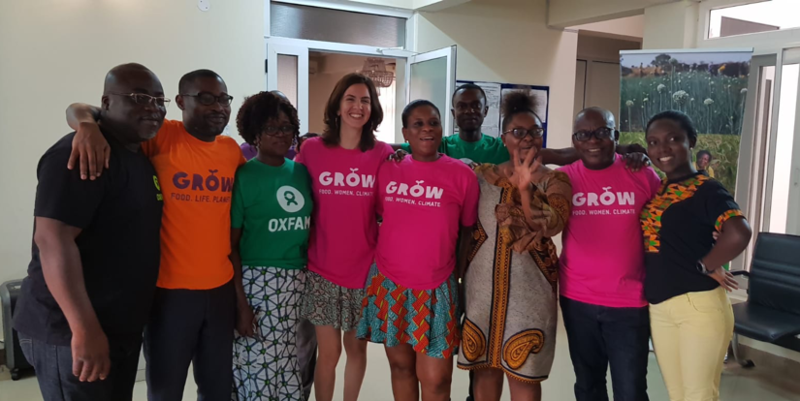 Part of the amazing Oxfam in Ghana team. Oxfam’s GROW campaign englobes BtB and other efforts on making the food system more fair and sustainable. Like the books I used to read whilst eating chocolate in my home in Santiago, my task has become almost the one of a detective, asking questions and following clues that we find in interviews and field visits. The goal is now helping the Oxfam-Ghana team to gain a clearer picture of who is doing what in the cocoa sector. For now, I can say that the distance between cocoa and chocolate is indeed very big; however, our interviews with farmers and local organizations, and the work with the team here in Ghana, show that there are good people doing good work in order to improve the lives of cocoa farmers. I feel grateful to be a part of their team—to witness and contribute to their important work in my own humble way.